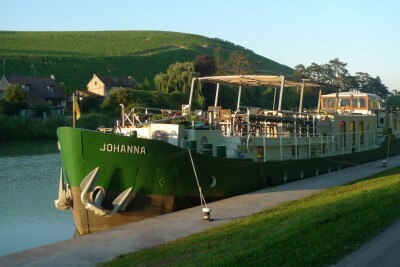 Barge cruises on the rivers and canals of France on hotelship Johanna. 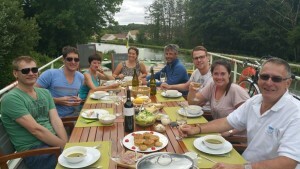 Discover the beauty of France on a relaxing barge cruise aboard hotelship Johanna. Explore the Champagne region the slow way. Enter Paris as you never did before. The recently converted hotelship Johanna offers charming luxury accommodations for up to 6 guests. Sailing on board Johanna is experiencing peace and tranquility as you pass trough the quiet countryside or visit picturesque villages and historic towns. Enjoy the beautiful landscape slowly passing by while sitting on the sundeck, sipping some of the tastiest Belgian beers, a glass of French wine or sparkling champagne and admire the endearing ways of the wildlife. Leisure and relaxation are at their best on our barge cruises. Time stands still while your hotelship slowly cruises to the day’s destination. Your guide and minivan driver awaits you there for a personalized excursion. The more daring guests can explore the region on bicycle or take a walk along the towpath. With only 6 passengers on board, we can give you a very personalized service. You feel at home away from home in our floating guesthouse. Relaxing is the aim and flexibility the name of the game. No cruise is the same. Affordable cruises: Premier class service at charming class prices. 14 Days between Bruges and Paris. Discovering tasty bubbles in Champagne. Yoga Pilates “balanced living” cruise. Bikram Hot Yoga experience cruise. World War I & II remembrance cruise. We'll send you a link to our PDF folder and keep you informed of our special offers, last minutes and other reductions. Please fill in the requested fields and check code. Relaxing on deck while your barge cruises the canal.